In summer seasin the difficulty of Mt Damavand 5671 m in Iran is almost the same as Mount Kilimanjaro 5892 m in Tanzania and Mount Everest Base Camp 5380 m in the Himalayans Range. But in winter and cold condition it is very difficult and it is quite different story and it should be compared to 7000 meters peaks or more. Visit also Damavand Weather Forcast. Mt Damawand is well-known for its mild slops, summer climbing to this summit is technically easy but physically moderate and climbers should be fit enough to try it. The main challenge of the ascend is acclimatization and the weather. Remember the ascend should be done only in a correct timing and in a suitable weather, otherwise it is very tough and risky in a bad weather condition and off-season. Visit also Damavand Forum. Difficulty: long and hard ascend, cold and wind , long descend. Most climbers who have managed to climb to the summit from West, North East, or North Face prefer to descent from south face because of its easy descend footpaths!! These are Mount Damavand Guides opinion only. There are usually differences between grading in different climbing routes. Regardless of the system used, all grades are an approximation. New Zealand: Grade 1, Easy scramble. Use of rope generally only for glacier travel. Alaska Grade: Grade 2 Either a moderate fifth-class one-day climb, or a straightforward multiday nontechnical climb. See also definition for Climbing Grade in Wikipedia. Schwierigkeitsgrad und Klettern Grad der Damavand. Vergleichen Damawand nach Kilimanjaro in Tansania und Everest Base Camp im Himalaya Range. Hike & Trekking im Sommer und Winter Führungen. Demawand Skitouren Expedition. Snowboarding in Iranski Resorts. Besten Service und die Logistik von eingehenden Bergtourismus in den Iran. Qualifizierte Führungsteams für den Iran Berge. Technische Informationen, wie Sie den Berg zu besteigen. Kletterausrüstung Liste. Demavand Karte. Budget Tour. 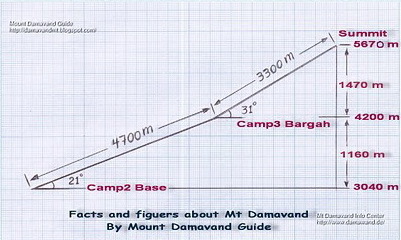 Difficulty and climbing grade of Damavand. 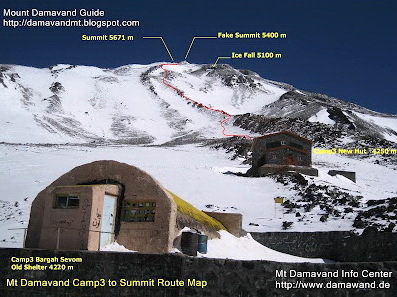 Compare Damawand to Kilimanjaro in Tanzania and Everest base Camp in the Himalayans Range. Hike & trek summer and winter guided tours. Demawand skitouring expedition. Snowboarding in Iranski resorts. Best services and logistics for incoming mountain tourism to Iran. Qualified guiding teams for Iran mountains. Technical info for how to climb the mountain. Climbing equipment list. Demavand Map. Budget tour. Dificultad y grado de escalada de Damavand. Comparar Damawand a Kilimanjaro en Tanzania y Campamento Base del Everest en la cordillera Himalaya. Caminata y caminata de verano y de invierno visitas guiadas. Expedición skirando Demawand. Snowboard en resorts Iranski. Los mejores servicios y logística para el turismo de montaña entrante a Irán. Equipos rectores calificados para montañas Irán. Datos técnicos de cómo subir a la montaña. Escalada lista de equipo. Demavand Mapa. Gira Presupuesto. Difficulté et le grade de l'escalade de Damavand. Comparer Damawand au Kilimandjaro en Tanzanie et Everest Camp de base dans la gamme Himalaya. Hike & trek été et hiver des visites guidées. Demawand expédition skirando. Snowboard dans les stations Iranski. Meilleurs services et de la logistique pour le tourisme de montagne entrant à l'Iran. Équipes directeurs qualifiés pour montagnes Iran. Information technique pour savoir comment gravir la montagne. Escalade liste d'équipement. Demavand Plan. Visite budget. Difficoltà e arrampicata grado di Damavand. Confronta Damawand al Kilimanjaro in Tanzania e l'Everest campo base nella gamma Himalayans. Hike & trekking estivo e invernale visite guidate. Demawand spedizione sci-alpinismo. Snowboard in località Iranski. Migliori servizi e logistica per il turismo di montagna incoming in Iran. Squadre di guida qualificati per le montagne Iran. Informazioni tecniche per come scalare la montagna. Arrampicata lista degli equipaggiamenti. Demavand Map. Tour Budget. Vanskelighetsgrad og klatring grad av Damavand. Sammenligne Damawand til Kilimanjaro i Tanzania og Everest Base Camp i Himalayans Range. Fot & trek sommer og vinter guidede turer. Demawand skitouring ekspedisjon. Snowboard i Iranski skianlegg. Beste tjenester og logistikk for innkommende fjellturisme til Iran. Kvalifiserte guiding lag for Iran fjell. Teknisk info for hvordan å klatre i fjellet. Klatreutstyrsliste. Demavand kart. Budsjett tur. Сложность и скалолазание сорт Дамаванд. Сравните Damawand Килиманджаро в Танзании и Базовый лагерь Эвереста в Гималаи хребта. Поход и поход летом и зимой экскурсии. Demawand skitouring экспедиция. Сноубординг на курортах Iranski. Лучшие услуги и логистика входящего горного туризма в Иран. Квалифицированные руководящие команды для Ирана горы. Техническая информация о том, как подняться на гору. Восхождение список оборудования. Demavand Карта. Бюджет тур. Slozhnost' i skalolazaniye sort Damavand . Sravnite Damawand Kilimandzharo v Tanzanii i Bazovyy lager' Everesta v Gimalai khrebta. Pokhod i pokhod letom i zimoy ekskursii . Demawand skitouring ekspeditsiya . Snoubording na kurortakh Iranski . Luchshiye uslugi i logistika vkhodyashchego gornogo turizma v Iran. Kvalifitsirovannyye rukovodyashchiye komandy dlya Irana gory. Tekhnicheskaya informatsiya o tom, kak podnyat'sya na goru . Voskhozhdeniye spisok oborudovaniya . Demavand Karta . Byudzhet tur .